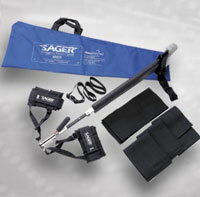 Sager Emergency Traction Splints enable accurate traction to be applied swiftly to a casualty who has suffered a fracture, or fractures, of the long bones of one or both legs (Femur - Tibia - Fibula). Besides being quantifiable, Sager traction is also dynamic, permitting the traction to decrease as the spasm releases. The Sager Splint can be applied with the patient in any position, even face down, which is an important consideration in pre-hospital trauma care. The Pneupac range includes a model suitable for infants up to 6 years old.